Contemporary open plan design breathes new life into Californian Bungalow to deliver indoor outdoor living in Wembley. A fatigued 1930’s Californian bungalow located in the inner city suburb of Wembley, with it’s leafy tree-lined streets and expansive verges, is transformed for a young couple with primary school age children. Threadgold Architecture was engaged to design alterations and additions to the family’s inner city California bungalow located in Wembley, Western Australia. The owner’s brief required alterations and additions that included new bedrooms, laundry, bathroom, kitchen, living, alfresco and adjoining pool which was sympathetic with the look and feel of the existing home but provided a contemporary shift from the existing – all on a strict budget. The design retains the majority of the existing house with the existing streetscape building fabric being left predominantly untouched and the living areas extended to the rear of the small inner city Wembley site. The new section of the house has expansive end folding timber doors which allows the home and garden to truly work as one space. The additions to this Wembley house had to conform to strict budgetary requirements and material palette including sourcing recycled jarrah to provide a seemless transition from old to new. The design spreads around an alfresco area which offers ample shelter and casual seating; so irrespective of season, the owners can enjoy the space year-round. The owners now enjoy free flowing open-plan indoor and outdoor living space where the kitchen operates as the focus of the house – connecting the adult living areas with the rear children’s environment. The material palette of the kitchen fit out delivered a contemporary shift as required by the brief and incorporates Caesarstone benchtops, Miele appliances and white colour backed glass splashback. 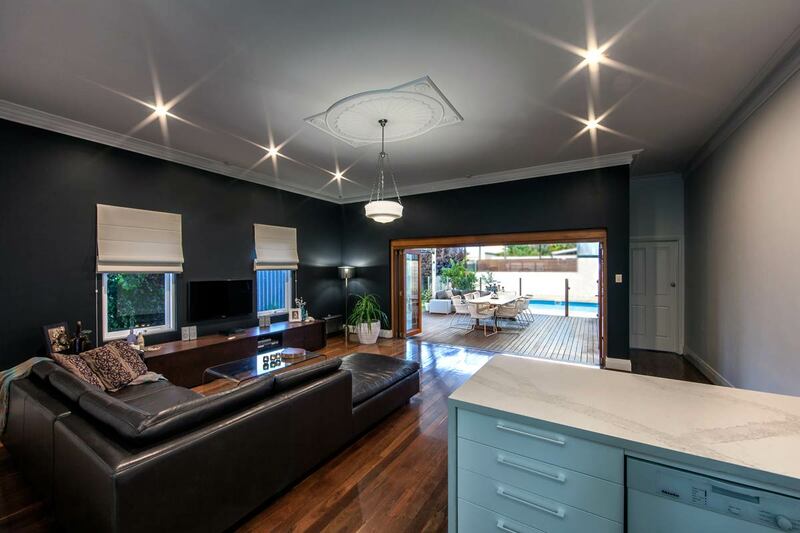 Threadgold Architecture is a boutique architectural practice established in 2008 with a South West Architectural Office, in Busselton, and Perth Architectural Office. We offer clients a personal and holistic design service of ARCHITECTURE + INTERIORS + PLANNING.